Paying Homage To Victoria Holt and Introducing "A Respectable Woman"
A couple of years ago, I wrote a blog about the book that made my best friend at school ignore me. 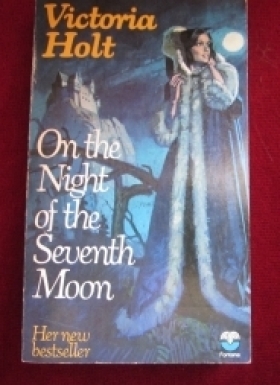 This was the book – On the Night of the Seventh Moon, one of Victoria Holt's wonderful gothic novels. My friend was so engrossed in it that she spent all break-time reading it instead of talking to me; and once I started reading it, I understood why and I asked for all Victoria Holt's books for my birthday. In that blog, I wrote: "Oh, how I loved those books. All those creepy mansions in Cornwall! All those governesses in peril! Thanks to Victoria Holt, to this day I have a feeling that the heroine's being in fear for her life is a basic requirement of the climax of a novel. And when I read a book in which this doesn't feature – which, let's face it, is nearly every book – I always feel a faint sense of surprise that a book can be perfectly enjoyable without this “essential” ingredient!" .... which is why I wrote the chase-through-the-fog scene in The Deserter's Daughter. There isn't a scene of mortal peril for the heroine in my new novel, A Respectable Woman, but I have paid homage to Victoria Holt in another way. You may know that the real name of Jean Plaidy / Victoria Holt / Philippa Carr was Eleanor Burford, who when she married became Eleanor Hibbert. In honour of Eleanor Burford Hibbert and the effect she had on my writing life, I have named my new heroine Nell Hibbert. Let me tell you about her. Nell had a wonderful childhood in a loud, laughing, loving family; but adult life, in the shape of the Great War, has been unkind to her. Her marriage, far from being a duplicate of her happy early life, has taught her to stand firmly on her own two feet and she is a determined, capable person; but beneath the feisty spirit, she is a real softy, who adores her children and likes nothing better than to spend her time playing with them. As Leonie, her dear friend and landlady, says of her, "Nell is the biggest kid of all." When Nell discovers that her husband is leading a double-life, she runs away to make a fresh start for herself and her young children in Manchester, where her neighbours and fellow-workers believe she is a respectable widow. Nell realises various things about herself in the course of her story; that she is imaginative, talented and ambitious; that love can sneak up on you; and, hardest of all, that the past is difficult to run from. When Nell was coming to life in my mind, I wanted her to be the sort of person I'd like to be friends with. I hope you'll want to be friends with her too. A Respectable Woman will be published in June in hardback. I hope you'll put in a pre-publication request for it at your local library. Jan, I'm so pleased that you are looking forward to reading Nell's story. I appreciated your support of The Deserter's Daughter. Nell's story is very different to Carrie's, but just as enjoyable, I hope! Jen, I'm pleased not to be alone in using the name of an admired author as the name for one of my characters. I must re-read your Firefly Lake books and look out for the Aldrich person. The books written as Jean Plaidy and Victoria Holt were quite different - the VH stories were historical gothic romance while the JP books were all based on fact. Thanks, Maddie. I'm glad and rather relieved that you already knew that Jean Plaidy, Victoria Holt and Philippa Carr were all one and the same person. Judging by previous comments, I was thinking that maybe I was the only one! Thanks for your kind words about A Respectable Woman. Great blog as always. 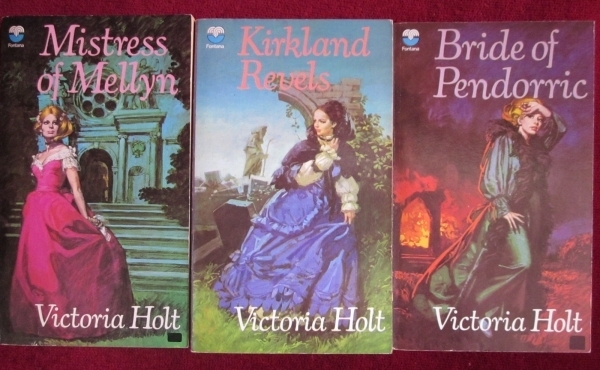 I absolutely loved Jean Plaidy and Victoria Holt and Philippa Carr. Murder Most Royal remains one of my favourite books to this day. What an amazing and prolific writer she was. Your next book sounds fascinating and I can't wait to read it, many congratulations! What an interesting post, Susanna. Not only am I now looking forward with even greater anticipation to reading 'A Respectable Woman' (and I'm already cheering for the heroine to find her happy ending), but on my next library visit I must look for some Jean Plaidy/Victoria Holt books--like others, I didn't know they were the same person. It's also lovely to know that I'm not alone in honouring favourite authors through character names. I gave a character in two of my 'Firefly Lake' books the surname 'Aldrich' to commemorate Bess Streeter Aldrich whose books I adored as a teen. I'm glad you enjoyed Victoria Holt's books too, Kate. Have they stood the test of time? Interesting question. I loved them so much in my teens. I'd like to think they are just as enthralling now. Thanks for your good wishes regarding A Respectable Woman. 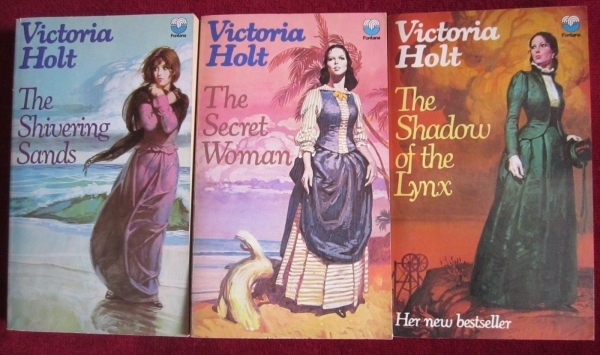 I remember picking up all those Victoria Holt novels from the library as a teenager. They were so romantic and thrilling! I’d love to read one again and see what I think of them now. Julie, lovely to hear from you. I hope you are enjoying your writing retreat. Yes, the covers are very much of their time, aren't they? But I do love them. Well, Karen, I thought it was common knowledge that Jean Plaidy and Victoria Holt were the same writer, but judging from comments here and on Twitter, obviously not. The Victoria Holts are gothic stories, so maybe they will fit in with the gothic novel you are writing. A Respectable Woman sounds fantastic, Susanna. I just love the wonderful characters you create. I can't wait to read it! I've also learned something else from your blog today. As a teen, I read all my mum's Jean Plaidy books and absolutely adored them (learned most of my history from them too! Much better than the boring stuff we were taught in school), but I had no idea she was also Victoria Holt. I have never read a VH novel, but perhaps I should rectify that asap. Kirsten, I remember the Jean Plaidy book about Mary, Queen of Scots as well, but I was never as keen on the Plaidys as I was on the Victoria Holt gothics. I hope you will enjoy A Respectable Woman. Christina, it's lovely to hear from you. I'm so glad that you like the sound of Nell. I like her enormously - but then, I'm biassed! Good luck with all the work you are doing in schools at the moment. I am enjoying all the Twitter photos. I must admit I had no idea that Victoria Holt and Jean Plaidy were one and the same. The Young Elizabeth (something like that) was a real favourite as a child. There was one about Mary Queen of Scots too as I recall. What a truly fascinating post, Susanna. Nell sounds like a wonderful character - I cannot wait to read her story! Thank you, Louise. I'm glad you like Nell and I hope you enjoy reading A Respectable Woman. I loved writing it. How lovely to name your new character after a favourite author. I like the sound of Nell and will definitely read her story. I'm glad you liked reading about how Nell came by her name, Tara. For me, it felt like the natural thing to do. 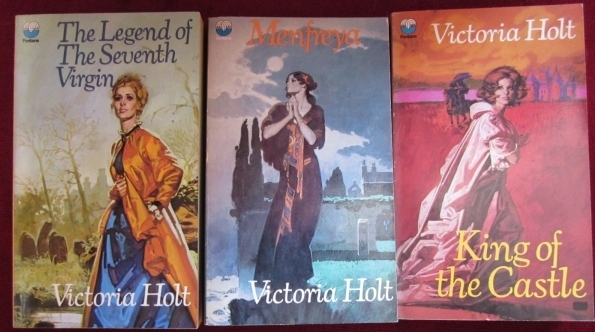 I've never forgotten the pleasure Victoria Holt's books gave me. I love her name and the story behind it. Not only do I want to read Nell’s tale but I’d also like to get my hands on some Victoria Holt books too! Yes, she wrote historicals based on fact as Jean Plaidy; gothic romances as Victoria Holt; and a series about a family through the ages as Philippa Carr. I hope you will enjoy A Respectable Woman, Catherine. Thanks for commenting.